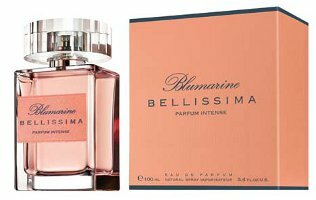 Blumarine will launch Blumarine Bellissima Parfum Intense, a followup to last year's Bellissima, in September. Like the original, Bellissima Parfum Intense was developed by Sophie Labbé. The floriental fragrance includes notes of morning dew, ginger, orange, grapefruit, peony, passion flower, jasmine, cashmere, sandalwood, vanilla orchid, musk and heliotrope. I actually like Bellissima but never bought a bottle. I will defintely sample the Intense when available. I got a sample of the original at Nordstrom, and like you two I thought it was pretty and nice but didn’t really want to buy it. I suppose I would smell the intense if I passed it by, but I doubt I would be any more intrigued. Lately I have been liking more and more “weird” fragrances, so I don’t think pretty is going to cut it. This sounds pretty; I’ve been liking the delicately feminine peony lately… and the bottle is nice looking too! It does look like a nice bottle. Never heard of it before…..sounds kind of nice….love the bottle. But everyone knows I love those big chunky glass bottles. I might be turning into a bottle ho…..this is a revolting development! Nordstrom had it. Don’t think I saw it anywhere else, but wasn’t looking either. Daisy – oh no … getting into the bottles too is the kiss of death (or, as we say in my place of employment), a harbinger of “accelerated spending”! oh “accelerated spending” …yeah….I’ve already got that! I’m not sure any MORE accelerated is possible…I mean some things are limited by the physics of this dimension, ya know? I like the phrase “accelerated spending.” It’s not compulsive shopping, it’s just accelerated spending! That almost makes it sound like an accomplishment. Like being in the gifted program for shopping. The gifted program! I like the way you think. So do I! Mostly because I am very…gifted..here. I like the bottle! I’ve never tried anything from Blumarine but this sounds nice enough. One of my favorite new fragrances… definitely a must buy… LOVE the original Juice, this sounds just as lovely! nothing special….A bunch of flowers in a bottle,nice for housewifes and grandmom’s ..